In March 1887, Spurgeon published in his monthly magazine, The Sword and the Trowel, an article titled “The Down Grade.” The article, published anonymously but written by Spurgeon’s friend Robert Shindler, declared that some ministers were “denying the proper deity of the Son of God, renouncing faith in his atoning death. . . . ” They were, Shindler said, on a slippery slope, or “Down Grade,” away from essential evangelical doctrines. In the following month’s Sword and Trowel, Spurgeon wrote, “We are glad that the article upon ‘The Down Grade’ has excited notice. . . . Our warfare is with men who are giving up the atoning sacrifice, denying the inspiration of Holy Scripture, and casting slurs upon justification by faith.” That summer Spurgeon wrote further on Shindler’s theme. Controversy developed, Spurgeon became the focal point of the charges, and the Baptist Union, which was bitterly divided over the question, ultimately voted to censure him. Explaining the tangled affair is Dr. Mark Hopkins, lecturer in church history at Theological College of Northern Nigeria. 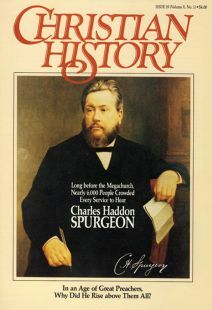 During the height of the Down—Grade Controversy, in 1887–88, The Sword and the Trowel, Spurgeon’s monthly magazine, contained something about the dispute in every issue. The Down—Grade Controversy of 1887–88 was the most dramatic and the most disastrous episode in Spurgeon’s career. It was also the severest crisis ever faced by the Baptist Union, the body to which Spurgeon belonged. In the flurry of charges, none of the principal players cared to expose key information that lay hidden from public view. However, some important missing pieces of the jigsaw have turned up recently. It is now possible to sketch the story more accurately. Why Did Spurgeon Start It? Spurgeon was not campaigning for an evangelical basis for the Baptist Union nor attempting to expel its liberals. He saw that liberalism would grow and prevail for a while to come and he was not so naive as to suppose that it could be stopped by resolutions. Again, he was not trying to engineer a schism and start an evangelical union: the idea did not appeal to him and he did not think this could be a permanent solution. Lacking a positive program of any kind, Spurgeon had just two things in mind: (1) to warn against the rise of liberalism (he was more concerned about Congregationalism, in which it had taken deeper root, than about his own denomination); and (2) having thus satisfied his conscience, to retreat into the private world of his church and associated enterprises, which kept him more than busy and fulfilled. In 1887, in his magazine The Sword and the Trowel, Spurgeon delivered a wide—ranging but superficial critique. His message was that Nonconformists were on a slippery slope away from biblical doctrine and standards of behavior. Three doctrines, Spurgeon said, were being abandoned: biblical infallibility, substitutionary atonement, and the finality of judgment for those who died outside Christ. His passionate and outspoken language helped arouse attention. But perhaps the decisive factor in provoking an extensive debate was Spurgeon’s unfavorable comparison between Nonconformity [Protestant dissenters such as the Presbyterians, Congregationalists, and Baptists] and the Church of England. This was a potent bait, and when the Baptist Union met in October, the “Down Grade” was the main topic of conversation. Yet fear of troubling the theological waters kept the subject off the official program—Baptist leaders hoped the delete would fizzle out. The few references that were made dismissed Spurgeon, and he felt it time for the more congenial part of his plan: he resigned from the Baptist Union. If Spurgeon had had his way, the controversy would have ended at that point; but he was not to be let off so easily. When Spurgeon resigned, the controversy narrowed into an intra—Baptist dispute, but its intensity redoubled—Spurgeon’s national fame ensured that his resignation dealt a heavy blow to the reputation of the Baptist Union. For his part, Spurgeon was determined not to name anyone—he was well aware of the backlash he would face if he created martyrs. He carefully negotiated the meeting’s terms to rule out any discussion of his previous actions. The meeting would simply discuss what the Union might do to put its house in order. Spurgeon was stunned, then, when his charges and resignation were brought up at the meeting (held on January 13, 1888). Following this coup de main, the Council passed a resolution known as the “vote of censure,” which said that since Spurgeon declined to give names and supporting evidence, the Council considered that his charges ought not to have been made. Spurgeon felt bitterly betrayed. The deepening cycle of confrontation was broken when Spurgeon dissuaded his supporters from trying to reverse the vote of censure, and when a more severe censure motion was defeated in the February Council meeting. The third and final phase of the controversy revolved around competing declarations of the Union’s faith. The Council passed a resolution that had the delicate double aim of vindicating the evangelical credentials of the Union while not straining the consciences of its more liberal members. Meanwhile, supporters of Spurgeon’s protest, as surprised and shocked by his resignation as were his critics, finally began to make an impact under the leadership of Spurgeon’s brother James. A few had resigned and joined their leader on the sidelines, but the majority campaigned for the adoption of doctrinal declarations that would restore the Baptist Union to an unequivocally evangelical allegiance. Spurgeon supported them, not because he had become more optimistic about the prospects for success, but because he thought it only right that they should attempt to do something about the “Down Grade” before resigning, just as he had done earlier. At a Council meeting just before the Annual Assembly, efforts were made to bridge the gap between two sets of doctrinal declarations, one more evangelical than the other. Negotiations were finally successful just five minutes before the crucial session was due to open (on the afternoon of April 23, 1888). Delegates and spectators, who had expected to witness the rending of the Baptist denomination, were astonished to learn that James Spurgeon would be seconding an amended resolution. It was a strange scene: the proposer had no time to rewrite his fighting speech, and James Spurgeon’s contribution was suffused by doubt as to the wisdom of his action. Indeed, the last-minute concessions he gained amounted to little; he was outmaneuvered. Had the vote taken place, what would the result have been? Both factions had slates of candidates for the Council elections that took place on the same day; the results of these would indicate support for Spurgeon in the region of 25 to 30 percent. Spurgeon was devastated when he learned what had happened. A dark shadow was cast over his last few years. The Baptist Union’s supporters could be relieved by the reprieve, but beyond that they had little cause for satisfaction. The basic problem with the Down-Grade Controversy was that the central theological issues were never really addressed. And Spurgeon, who had generated more heat than light, was partly to blame. Mark Hopkins is lecturer in church history at Theological College of Northern Nigeria.